No repair job is too big or too small for us. We offer a full range of repair services that can cover all types of damages. Depending on the type of rug, monetary and sentimental value, we can offer the right repair method to suit your needs. Our weavers have extensive knowledge in repairing hand woven rugs, machine made rugs, oriental rugs, Persian rugs, Needlepoint rugs, Kilim Rugs and everything in between. For area rugs that have holes in them, we can recreate the foundation of the rug, matching all the color dyes and design while stitching the pile, to ensure the repair work will not be able to be seen by the human eye. 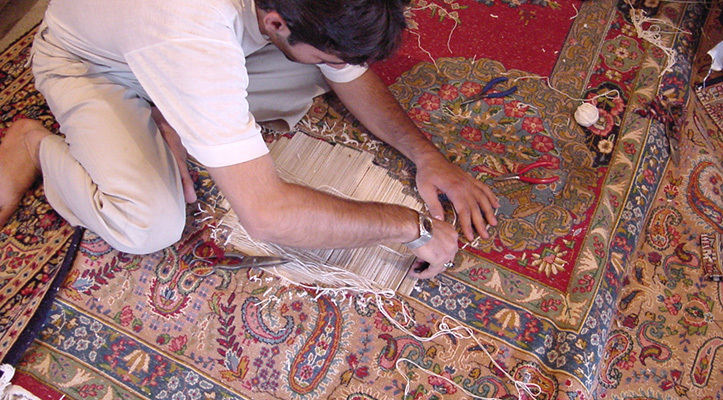 Fringe Damage is a very common issue with rugs and one that we repair often. Repair work is always done by hand and in the case of fringes we use original materials from the rug itself, pulling the foundation up to re-create the original fringe. Sometimes there is more than one option when dealing with repairs. Our weavers can help find the option best suitable for your type of rug and your budget. As always, we offer free no obligation inspections on any repair work in question.